Because identification is so important, the Wunderwagon -HC can be tailored with the addition of custom text to the handle and/or seat back. This gives hospitals an additional means to track the wagons and ensure they remain in the appropriate location on the hospital premises. 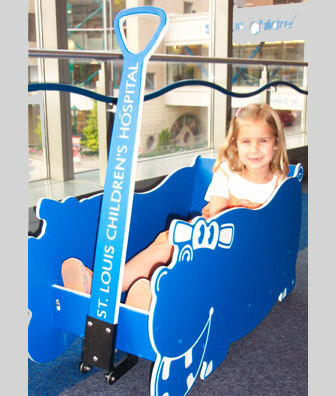 It also provides signage for the hospital and demonstrates their commitment to serving the whole child and family. From a corporate perspective, personalization allows any Wunderwagon - HC to recognize the individuals, organizations, or businesses that make contributions to the hospital. Since the text and/or logo are physically "cut" into the material as part of the manufacturing process, the contributor's commitment to the community and its children can be easily and clearly acknowledged. Please call us to discuss your interest in customization and personalization -- 314.323.1530 . © 2016 Wunderworks of America, LLC. All rights reserved.